All pipe fittings threads are made to Dryseal standards. Special fitting configurations and/or sizes available. 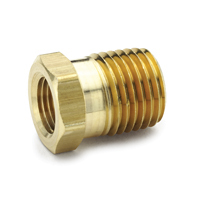 Brass pipe fittings meet SAE J530 and SAE J531 specifications. Silencer Mufflers (Aluminium Body): Unique design provides a superior noise reduction to O.S.H.A. standard with minimum effect on air efficiency. Aluminium body and screen element resists rust, corrosion and melting. 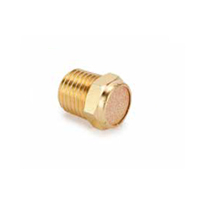 Sintered Bronze Muffler-Filter:Compact design effectively diffuses air and muffles noise from valve exhaust ports. Noise reduction meets O.S.H.A. standards. 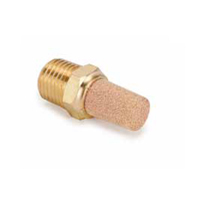 Muffler filters also protect valves, airtools and air components from dirt and other foreign matter. Standard 40 micron element. Muffler Speed Controls:Provides dual job of metering exhaust air to control cylinder or tool speed and muffles noise to meet O.S.H.A. stnadards. 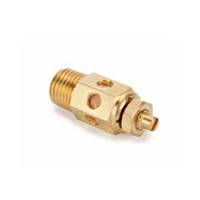 These filters are capable of a wide range of flow settings and are equipped with lock nuts to maintian setting. Standard 40 micron element. Breather Vents - Low Profile:Low profile vents have many applications for vacuum relief or pressure equalization on gear boxes, oil tanks or reservoirs. 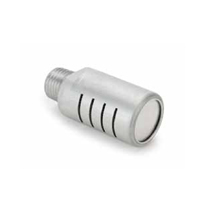 Also for single acting cylinder ports. 40 micron standard element. Breather Vents:Provides dual job of metering exhaust air to control cylinder or tool speed and muffles noise to meet O.S.H.A. stnadards. 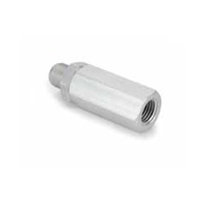 These filters are capable of a wide range of flow settings and are equipped with lock nuts to maintian setting. Standard 40 micron element.